I couldn't help but smile when I received this email from change.org. I smiled because I realized: "they've got me". I would like to show you how change.org persuaded me to share a petition on my facebook and twitter feeds. Which isn't that easy. 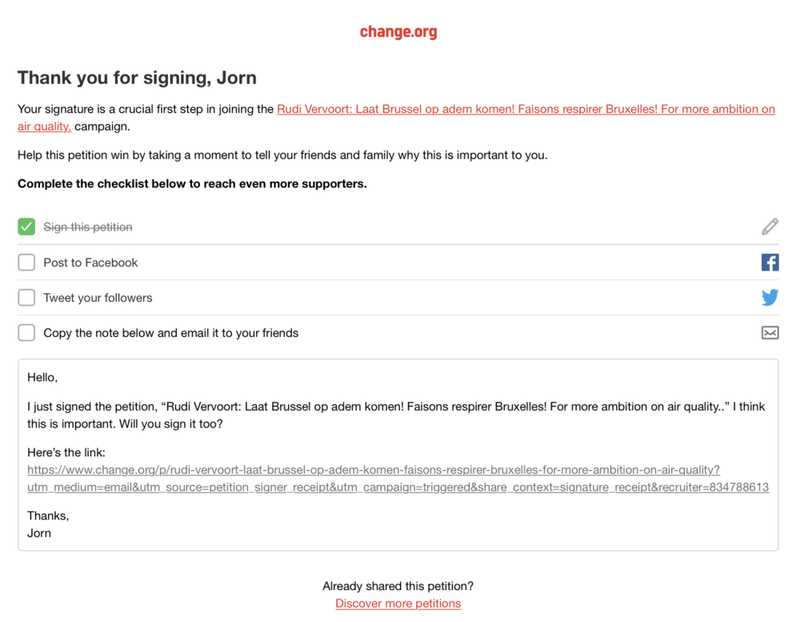 I sign a bunch of petitions to plea for a more just, healthy and sustainable world. But I often refrain from sharing these petitions with my network. I too feel the reluctance of being 'that guy'. The one who is always in campaign mode. So I mostly just sign. And when asked to share this petition with my network to 'tripple my impact', I usually close my browser. Change.org also asked me to share the petition straight after signage. But their genius move was sending this email some hours after. This email is a simple masterpiece of persuasive design and persuasive copy. And it's all built around the brain ninja principle called 'commitment'. The urge to finish what you've started. To complete the job. See, what normally happens after you've signed a petition, is that you feel like you're done. You've finished what you came for. When being asked to 'share your petition', you feel like you're going the extra mile. Like you're granting a favor. Ofcourse you understand that sharing your act would be completely logical. And it would 'triple your impact'. But psychologically it feels like a different thing. That's your irrationality playing up. - "Complete the checklist below..."
This email has a clear goal, doesn't beat around the bush and has just enough motivational copy to win you over. Hail to change.org. I've shared the petition. Going to the toilet? Do not take your phone. I just went to the toilet. As I was standing up to go there, I reached out to grab my phone. I wanted to take it with me to have some quality toilet time. You know what I mean: scanning the news, checking up on notifications, having a quick scroll through the Instagram feed. In that instant I realized that this is one of the dumbest habits I have. For one: Toilet time should offer a relaxing break. But I rarely leave the toilet more relaxed. Despite the fact that I relief myself, I also expose myself to a bunch of impulses. And I notice more and more that this constant input from my mobile screen is causing restlessness, distraction and a permanently frowned face. Secondly and most important: The time spans spent on the toilet have been my most creative and innovative by far. I got my breakthrough insight for my master's thesis while taking a pee. I have come up with at least 5 business ideas while standing in front or sitting on the toilet seat. I can't keep count of the times I ran out of the toilet to a piece of paper to write down the exact words I need for an assignment, or note the building blocks for a new strategy. Toilet time is not the only time this happens. It also happens to me while running and while driving. It’s in these moments where you focus on a certain kind of physical action that your mind gets some time off. In these moments your minds gets to the perfect intersection of focus and space. It’s at this intersection of focus and space that the magic happens. You also hear about these moments from other people. You must know someone who has their sparks of genius under the shower, right? I just realized that I have been suffocating my brains on these critical moments for peace of mind and sparks of genius. No more my friends. The climate crisis has a deadline. It always had. Only now, time is running out real fast. In this post I want to make clear that every single one of us makes an impact with every single choice we make. For society is the sum of every action of every individual. Every choice you make is a vote for the world you want to live in. I also want to give you some numbers to give you a frame of reference of the extent in which our lifestyles will have to change. I do not want to be paternalistic. All of these numbers and pieces of advice feel like people are brutally forcing you to do something. Like I am forcing you. And people don't like that. Truth is, I find it confronting too. But do we really have a choice but change? Knowing what we know, can we decide to look the other way for the sole reason that it makes life easier, for a very short while? To be able to turn things around and create a sustainable, balanced world, policy changes will have to be made. And they will have to be big and bold. The fact that policy makers will have to make these tough choices, doesn't mean the rest of us can sit back and relax. Each and everyone of has the possibility to give a politician more (or less) power. By voting. By making your voice heard. Next to the political actions that'll have to be taken, we can (and should) all start making lifestyle changes. Recycling and energy efficient light bulbs are great ways to start, but they are in no way enough. A recent study (published 12th of July 2017) shows that carbon emissions must fall to two tonnes of CO2 per person by 2050 to avoid severe global warming. That is a really big change since US and Australia emissions are currently 16 tonnes per person, the Netherlands are at 10 tonnes per person, Belgium is at 8 tonnes per person. Which lifestyle changes will have the most impact? This gives us a fairly good idea of the things we need to start doing in order to reach our goal. To simplify it with an example: I'm Belgian, so let's take the average Belgian creating 8 tonnes of CO2 per year. He needs to get to 2 tonnes or less per year in order to avoid severe global warming. So he needs to cut 6 tonnes. He could sell his car (2,4), not take a planned transatlantic trip (1,6), buy green energy (1,47) and become a vegetarian (0,82). That's, 6,29 tonnes saved. That's all hard changes. But not undoable. The study had one very shocking finding though. Apart from the impact of actions visualized above, the impact of having one fewer child is 58,6 tonnes per year. The impact of one child was calculated by adding up the emissions of the child and all their descendants, then dividing this total by the parent’s lifespan. Each parent was ascribed 50% of the child’s emissions, 25% of their grandchildren’s emissions and so on. The scientists stressed that every lifestyle choice is a deeply personal one. But that it is their job to give an honest report of the data. Lets prioritize our values and starting defending them. For me personally, ruling out the option of having children is something I don't want to think about. This is core to being human for me. But that means we have to drastically change our other lifestyle choices. That means we have to change the bigger system creating these lifestyles. And we don't have any time to lose. I love this quote I heard a while ago: "Hard choices, easy life. Easy choices, hard life." The way I interpret it, is that if we can make hard lifestyle choices, if we find the courage to step up to big corporations, if we dare to defend our values against the dominant cultural opinion, then our life will eventually be easier. We will be able to hold our head up high. We will be able to look in the mirror without guilt. That is an easy life, at least for me.